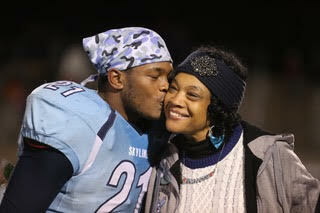 Charles Jones is captain of Skyline’s football team, as well as homecoming king. Photo by Jo Mathis. Editor’s note: Six AAPS high school seniors were recently named “Young Men of Promise” by the Delta Psi Omega Chapter of the Alpha Kappa Alpha Sorority. This is the first in a series of profiles of these young men, who were nominated by their school counselors. These students were recognized during the chapter’s annual Celebration of Black Men Brunch which honors local African American men who have given back to the community through service in the arts, business/economics, community service, education, health and as a trailblazer. Manley said the sorority decided to also honor black high school students because too often the their accomplishments go unrecognized. “We want to raise their self esteem and let them know their hard work is noticed,” she said, noting that so many African American students in AAPS are succeeding on many levels. Charles Jones will graduate early and attend Central Michigan to pursue a degree in international business with a focus in Mandarin Chinese. He has been recognized by the NAACP for academics, as well as Alpha Phi Alpha for being an outstanding scholar. Family: Parents Charles and Tamala Jones; sister, Charde Fontes; sister, Morgan Jones. Highlights: GPA is 3.4. Member of the Skyline High School Sky Squad—a restorative justice practice program. A 2014, 2015, and 2016 NAACP Student Scholar Award recipient, and a 2015 Alpha Phi Alpha Fraternity Theta Zeta Lambda Chapter Student Scholar Award recipient. 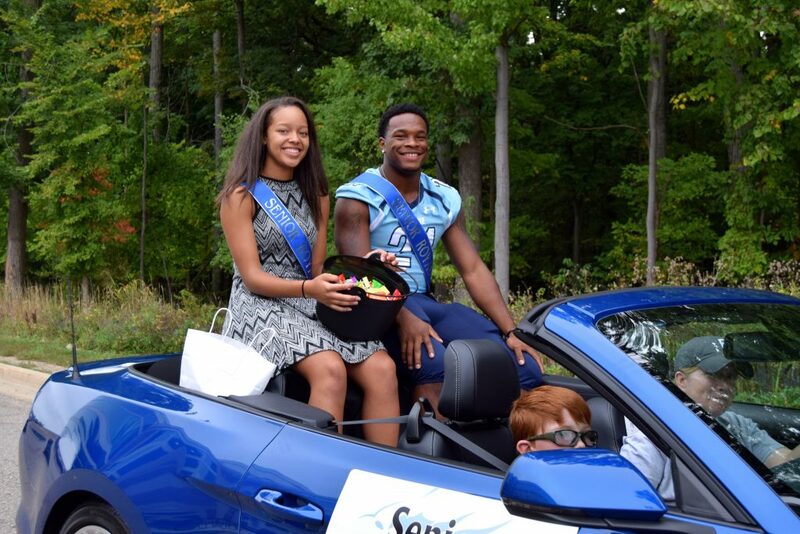 Skyline High School 2016 Homecoming King. Member of Skyline’s Student-Athlete Advisory Counsel. 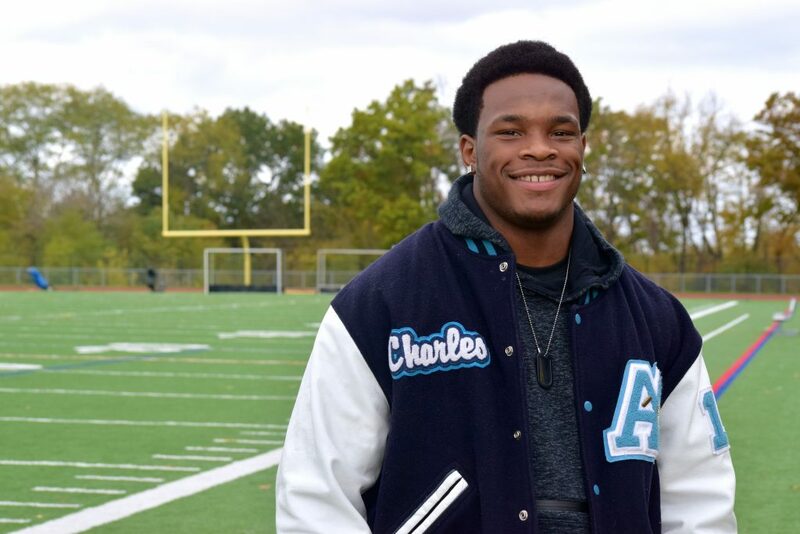 Four-year letterman for the Ann Arbor Skyline Football Team. Captain of the team as a junior and senior. Part of the football team’s leadership development group. If you could have witnessed any event in history, what would it be? I would want to witness the Harriet Tubman and how she was able to maneuver people through the underground railroad and create these secret passages. This was a great representation of innovation and the will for change and better life. I would take notes on her determination and grit. Which AAPS staff members have made the biggest difference in your life? One of the high school counselors in my school named Amy McLoughlin has had a huge impact on my life with introducing and accepting me to be apart of a restorative justice program. During my senior year I decided to take African American Humanities, which is taught by Kay Wade and Tonya Whitehorn. They both have been very inspirational to me in helping me open up my eyes and explore my culture and past. Favorite hangouts: Buffalo Wild Wings, Pinball Pete’s, and hanging out at my friend Jacob’s house. Favorite music: Kid Cudi, Jaden Smith, Darius Rucker, Luke Bryan, Childish Gambino, and Logic. If you had a 10-year-old brother, what advice would you give him? I would advise him to always take chances and to explore new things while you’re young. This is the time where you do new things and learn from mistakes. I explored a lot of sports when I was younger and was able to find sports that best fit me as a person. I was able to learn things from them that helped me develop as a man and as a person. I would also advise him to challenge himself in the classroom. Take a foreign language that seems hard and attack it. I took Chinese and I enjoyed the challenges it brought. Life is going to come with a lot of challenges but you have to accept the challenge and don’t ever be afraid of it. What do you plan to do after high school? After high school I plan to attend Central Michigan University for football and plan to major in either business or some sort of social work because I like helping people. After that I hope to have my own business or be traveling around the world helping people with whatever they may need. What were you doing in your last selfie? In my last selfie I was hugging my mom and giving her a kiss on the cheek. If you could change the world … I would find a way to spread wealth out so that everyone is able to have money and people wouldn’t have to be homeless. I would also want to have the world put more of an emphasis on mental health because it’s a big problem in the world that people over look and don’t take as seriously.